Suffice it to say that Billie Joe Armstrong, Mike Dirnt, and Tré Cool (aka Green Day) have never shied away from sharing their feelings. Green Day (who just released their 12th album, Revolution Radio) received the MTV Global Icon Award at the 2016 MTV EMAs, and they put an exclamation point on their feelings about what’s happening in the USA with the 2016 election. Green Day dedicated “American Idiot” to Donald Trump at the 2016 MTV EMAs by changing the lyrics of their famous song, so I think it’s safe to say that they’re not fans of the Republican candidate. 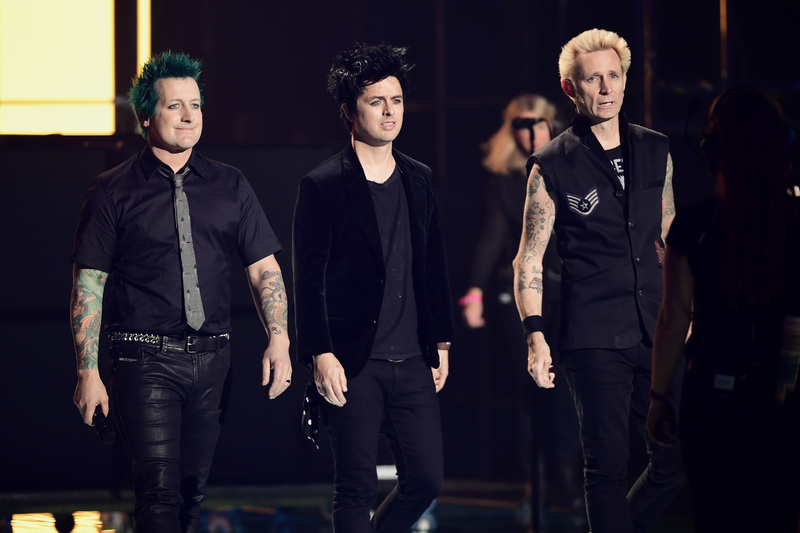 When accepting their award, Armstrong said, “It’s really nice to be in Europe right now… It’s nice to be out of America, just for a second, to be out of this horrendous election that’s going on right now that has… Our entire country is about to have one big collective heart attack.” Yes, we know, Billie Joe — it’s like a reality show that you can’t turn off. When Green Day played “American Idiot,” the song sounded the same, but the lyrics were just slightly different. Instead of “f**k America” and “idiot America,” Armstrong changed the words to “Trump America.” It was a subtle but still strong statement about their allegiances in the election. I can’t say I disagree with Armstrong’s words about the 2016 election — I think it’s made everyone on either side of the aisle a little crazy with its endless hateful rhetoric and vitriol. It’s exhausting, and I can’t wait until it’s all over. The same goes for Green Day — Armstrong wanted to make a strong statement about the way he and his band feel about all of it, and they did it in a perfectly punk-rock way.